First of all I had better apologise for the lack of posts recently. I think we're all a bit bogged down with lots of things at the moment - life has a habit of getting in the way sometimes doesn't it. I know the other girls have been working hard on their journal pages recently in spite of the fact that they have been under a fair amount of pressure but I am fairly certain that I am not going to make it at all with this month's project. As well as DT commitments and the usual demands made on a Mamma, mother, daughter and not to mention wife, I am in the thick of making lots of things for our Daughter's wedding which is coming up in May and I seem to spend half my life at our Daughter's either childminding so she can sort various things out for the wedding or going with her. It's all very exciting but very time consuming as she lives over 60 miles away. Weddings were much simpler when her Dad and I got married over 38 years ago, lol! Anyway, I do hope I'll be forgiven for missing out on this particular project. Now on to the the real reason for this post! 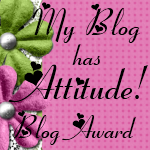 We have been given an award by a lovely blogging friend and wonderful crafter, Lynne (Creative Lynks). How special is that! We are really pleased and honoured to get this award as Lynne herself makes beautiful creations so please pay her blog a visit and feast your eyes on some wonderful artwork. This is the award. Now, we are supposed to tell you a few things about ourselves but hope you will forgive us if we pass on that one and we are also supposed to choose five blogs to pass the award onto. I always find it impossible to choose from all the wonderful blogs I visit regularly so to all who visit us please feel free to accept this award as a thank you from us for your kind support. Your visits and any comments you make mean such a lot to us and are very much appreciated. That's it for now friends but keep your eyes peeled as I think my buddies will have something to post for you soon and many thanks to Lynne for the award. Congratulations on your well deserved award!!!! Congratulations on your award! I always foloow your blog with avid interest as the standard of your work is amazing! Keep up the good work.